Several newly published studies reveal that flies, worms and humans share ancient patterns of gene expression. Although separated by hundreds of millions of years of evolution, flies, worms, and humans share ancient patterns of gene expression, according to a massive Yale-led analysis of genomic data. Two related studies led by scientists at Harvard and Stanford, also published August 28 in the same issue of the journal Nature, tell a similar story: Even though humans, worms, and flies bear little obvious similarity to each other, evolution used remarkably similar molecular toolkits to shape them. However, the same Yale lab reports in a separate paper published in the Proceedings of the National Academy of Sciences dramatic differences between species in genomic regions populated by pseudogenes, molecular fossils of working genes. 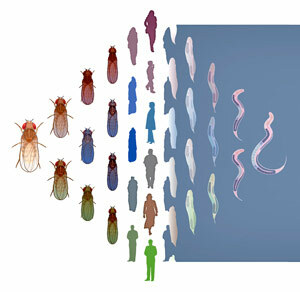 The human, worm, and fly genomes are all composed of the same building blocks (i.e. nucleotides) but differ greatly in size. The human genome, for instance, is more than 10 times larger than those of the worm and fly. However, the three have comparable numbers of functioning genes that code for proteins. Even more striking, note the researchers, the three share many expression programs turning genes on and off in a coordinated fashion. The gene expression patterns were so similar, in fact, that investigators were able to use them to match up the stages in worm and fly development. The study — spearheaded by members of the Gerstein Lab, including Joel Rozowsky, Koon-Kiu Yan, Daifeng Wang, Baikang Pei, and Arif Harmanci — looked at patterns of transcription, the process by which information encoded in DNA is transferred to RNA. The paper also reported that the control of this process by the packaging of DNA is very similar in all of the organisms. In fact, the authors were able to build a quantitative model of transcription for humans and then successfully apply it without alteration to the fly and worm. More than 200 scientists from dozens of institutions contributed to this effort, which is collectively part of the ENCODE genomics consortium. The resulting papers published in Nature all tell similar stories of shared evolution between species — for instance, the commonalities of regulatory networks of genes and the transcription factors that control their activation. Stark differences emerged, however, when Gerstein’s lab looked at pseudogenes — stretches of DNA that have lost their original protein-coding gene function and are no longer under strong selective constraint, effectively representing molecular fossils. In the August 25 issue of the Proceedings of the National Academy of Sciences, the Yale scientists reported vast differences between organisms in terms of these fossils, reflecting the divergent evolutionary histories of flies, worms, and humans. “On one hand, we saw similarities that reflect biological necessity and, on the other hand, differences that mirrored the organism’s history,” said Cristina Sisu, postdoctoral fellow in Gerstein’s lab and the first author of the pseudogene study. The work was funded by the National Human Genome Research Institute. 1 Comment on "Research Reveals Evolution Used Similar “Toolkits” to Shape Flies, Worms, and Humans"
Whether it is worms, flies or even bacteria apart from humans should have the enzymes enough to digest the food they take in. A bacteria engulfs the food particle through its skin (no mouth) and after digesting to the extent required by the enzymes produced, later casts them out (exocytosis). The worms in the gut or bacteria in the gut is responsible for digesting to the extent possible the hard raw food which animals take and digest them. They are also helpful in human guts by helping digestion. Thus these worms, flies of the earlier generation had a molecular machine or encoded protein in DNA to manufacture enzymes. Whereas these primitive worms were enzyme factories, humans who takes cooked food, by evolution have lost the ability to digest any raw food and even milk in some cases. Hence our molecular factory of enzymes is whittled down by evolution to the extent required. Thus it is not surprising that protein coding DNA are common in our ancestors…. to the date in humans. Evolution is playing miracle and the copies of DNA are retained to the extent it is required and new proteins are formed as the days go by. Thank You.